The best of Okinawa’s jazz musicians are teaming up for a very special performance at Okinawa City’s Plaza House. 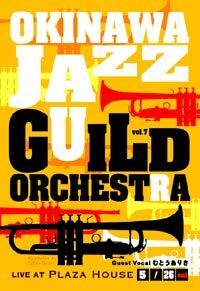 The romantic Saturday evening sponsored by the Okinawa Jazz Guild Orchestra will give music lovers the best of both jazz standards with new arrangements, and original songs, as well. The live performance will be in the G-Area at Plaza House, beginning at 7:30 p.m. The evening affair is more than just music, as there’ll be wines and cheeses to enjoy while listening to the All Okinawa jazz musicians. Admission to the performance is ¥2,000, or ¥1,500 if in possession of a concert flyer. Entry price does not include the wines and cheeses. The Okinawa Jazz Guild Orchestra normally performs in the Naha area, drawing full house crowds for each program. Saxophonist Kohamoto Tadashi is leading the 18 musicians for this fantastic evening. Bun Iwasaki, Jun Ujifuku, Satoru Joe and Itaru Miyara will be on saxophone, while Naoki Motozumi, Mitsuhiro Wada, Saburo Hosokawa Jr., and Tsuyoshi Kinjo play the trombones. Trumpets include Kawakami 3, Golgo Nakaezu, Marther Yoshikawa and Keiichi Colgate. Kousuke Joujima performs on guitar, Ganji Nishigaki on bass, and Snake Sumikawa on drums. Guest vocalist for the Plaza House performance is Arisa Muto.